I traded places with MA for our Monday night game. 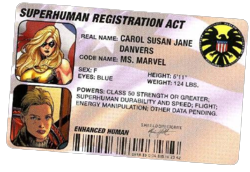 I’m now the Watcher [GM] for our Marvel Heroic Roleplaying game and MA is playing Captain America. Sidenote: MA has played a very Captain America-like Paladin in our Pathfinder games. This is a good transition character for him. MA has very little experience with the superhero genre in any form. The event I am running can be found here and, although it is intended for different characters, it takes little modification to make it work for a solo Captain America. Elegant system, very flexible. Nick Fury/S.H.I.E.L.D. has called Cap into action for a covert mission. Hydra has rebuilt an old Nazi stronghold and is using it for some nefarious purpose. His mission is to find a missing double-agent scientist, figure out what Hydra is doing there, and take appropriate action. Cap is air-dropped by a cloaked drone over the castle base in the German Alps. A normal human couldn’t survive the long trip strapped to the underbelly of a drone. That is one of the reasons he was picked. Cap parachutes over the castle and takes out two hydra patrol guards upon landing without issue. Hearing the Hydra guards speak German and the enviroment itself is a flashback for Captain America. His WWII memories flood back to him and it steels his resolve. When Nick Fury said he was perfect for this mission, he wasn’t kidding. 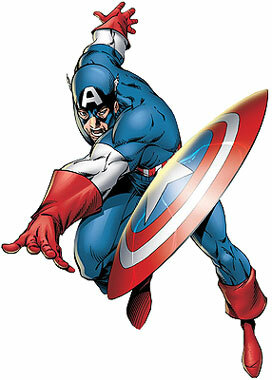 Cap is equipped with some high tech gadgets that have come in handy dealing with high tech security. MA and I have had a lot of fun playing up Cap’s lack of experience with modern technology. He takes out as many guards without killing them as possible. He uses a Hydra banner flag creatively to quietly take out the guards and get into the castle itself. We didn’t get too far into the adventure. We stopped after Cap captured a couple of terrified scientists.The German Hydra agents’ fear of Captain America is palpable. I may have played out dealing with the guards too much. But I wanted to give a feel for the setting. I knew the guards would be no Challenge for Cap. One aspect about Cap I think MM is playing very well: Balancing hero and soldier. There have been some Hydra deaths, but not brutal or unnecessary. Cap is a soldier and has little tolerance for Nazis or their successors. This is very tricky for most players. Most people go into Punisher mode and suddenly my Superhero game turns into a bloodbath. MA is also playing up Captain America’s intimidation factor. He is a one man army clad in a red white and blue Kevlar/chainmail. And that shield….can you imagine getting *thunked* by that thing? I have been playing up the German Hydra agents inherent uneasy feeling about Captain America. He is a living reminder of WWII, their Nazi roots, and past defeats. Annoying Sidenote: I have been trying to speak in a German accent when Cap interacts with the Germans. All (so far) of the Hydra agents are German since we are in Germany. Unfortunately my attempt at a German accent slides into a Russian accent fairly quickly. I know a smattering of Russian in real life and it just takes over. Wilson Black (HG) – A veteran of the Great War, Wilson has a successful medical practice near St. Mary’s in the Campus district and is a visiting physician at that institution. Though he left medical school after only three years to enter the Medical Corps. during the war, Dr. Black learned his trade quickly and has, thus far, been able to pose as a true doctor…even though he doesn’t have the paperwork to back it up. Wilson lives well, owning both an estate on West Derby in Northside and a country estate overlooking the Atlantic between Arkham and Kingsport. Dale Brewer (LL) – A graduate of Boston University, Dale is currently pursuing a Doctorate in Anthropology at Miskatonic University. He is also serving as a well-paid research assistant to Professor Tyler M. Freeborn and hopes to participate in the upcoming M.U. expedition to Australia. Dale is an excellent researcher and, in addition to his growing understanding of anthropology, is a budding geologist. He and his wife, Helen Brewer, rent a stately old house in the Campus district. Though he’s a big man, those who know Dale well know that Helen wears the pants in the family. Helen Brewer (LL) – Like her husband, Dale Brewer, Helen is a graduate of Boston University. She’s something of an artist and sells enough paintings to nicely supplement her husband’s M.U. salary. With her deep “Southie” accent and brash attitude she feels more at home spending time with the “boys” at the speakeasy in Northtown or attending a reading at the Desolate Highway Cafe on West Armitage than attending a Rotary Club or D.A.R meeting. The couple’s freshly painted mailbox reads “Helen & Dale Brewer” and is the talk of the neighborhood…only slightly less so than the dearth of dresses and skirts in the young woman’s wardrobe. Harland Doyle (MA for TG) – Residents of Arkham know Harland only as a wealthy newcomer from Boston and most assume he is the scion of some nouveau riche Irish immigrant family from that city. They’re partially right. Harland’s father, Michael “Mikey” Doyle, is a kingpin in the Boston Irish mob and Harland was an up-and-coming street captain until he recently ended the career of an audacious young DA and had to “go on the lam”. 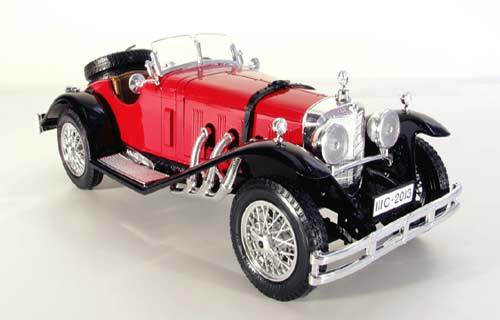 Now he’s hiding out in Arkham, though he’s by no means keeping a low profile: he recently purchased the substantial estate on West Derby (next door to Dr. Wilson Black) and Harland’s shiny new 1928 Mercedes-Benz SSK, custom-ordered directly from Germany, is often seen on the curb near the speakeasy in Northtown. Sam Green (HG) – Recently moved from New York, Sam is a young private investigator just beginning to make a name for himself in Arkham. Although he’s only had his office in the downtown area open for a short time, Sam has already built a well-paying practice thanks to his silver tongue, backed up by not inconsiderable skill in his profession. Quinton Nothnagel (MA for TG) – A recent graduate of M.U.’s archaeology program, Quinton is currently pursuing his Masters in the field and serves as an unpaid researcher for Dr. Francis Morgan, the chairman of the department. The lack of pay isn’t an issue for Quinton, however, as he is the only son of a wealthy Arkham family and receives a monthly stipend. The brilliant budding scientist has already advanced his knowledge of archaeology well beyond his current education level and has become something of an expert in history as well. Like Dale Brewer, Quinton hopes to accompany the upcoming M.U. expedition to Australia. It was with this cast of irregulars that we began our investigation into the weird goings-on in legend-haunted Arkham. The evening started quite innocently, at the Northside estate of Harland Doyle and a small social gathering that included Harland’s neighbor, Wilson Black, and some friends from the speakeasy and their family and associates. After a light dinner and a few tumblers of Irish Whisky (rather a 1913 Armagnac Dupeyron for Helen) the group retired to the parlour to enjoy Helen’s lovely piano-playing for a bit. Harland brushed aside the drapes at around 7:30 p.m. to notice his neighbor across the street, Bernard Corbitt, returning home from his usual Sunday evening outing. Mr. Corbitt, a successful local businessman, engages in the “gentle art of botany” and had previously told Harland his expeditions center around “gathering cuttings and samples and such”. This time, Mr. Corbitt’s efforts had yielded two canvas-wrapped packages – one long and cylindrical, like a small baseball bat, and one spherical, about the side of a small melon. “Strange bird, that Corbitt.” remarked Harland, drawing a few of the others to the window to see. They all watched as Mr. Corbitt reached his front door and fumbling with his keys in the notoriously sticky lock, his packages under one arm. Just as he wrenched the door open his packages went flying. The spherical bundle rolled down the walk and bumped off into the grass, while the cylindrical rolled completely down the walk to the edge of the street. The twine holding it securely must have snapped or untied because, as it came to a rest, the canvas fell open revealing the bundle’s contents: a pale white object with several protrusions in one end. And, so, the group made its fateful decision and crossed the street toward Mr. Corbitt’s pleasant estate. By now a light had come on in the basement, quickly obscured by drawn drapes. Harland and a couple of others approached the door while Helen, Sam, and the rest decided to see if they could peek into the window. Harland’s efforts at the knocker were met with no answer…but the group at the window, into which they could not see, were treated to strange gurgling noises and something like the crackling of electricity. Both groups reunited to discuss the matter. Now it seems that, among some of the group of friends and acquaintances, there is a real fear that the unassuming Mr. Corbitt may be building some sort of Frankenstein’s monster down in his basement. Though Dale and Quinton have important classes and work tomorrow, Harland and Helen and one or two others have the day free and have resolved to return to investigate the situation while Mr. Corbitt is at his office. Yes. I’m sure that’s a very good idea! We’ll again take up the strange case of Mr. Corbitt this coming Sunday! LL and I get together on Monday evenings to try random RPG systems, play non-RPGs, drink a couple of homebrews, and just hang out. 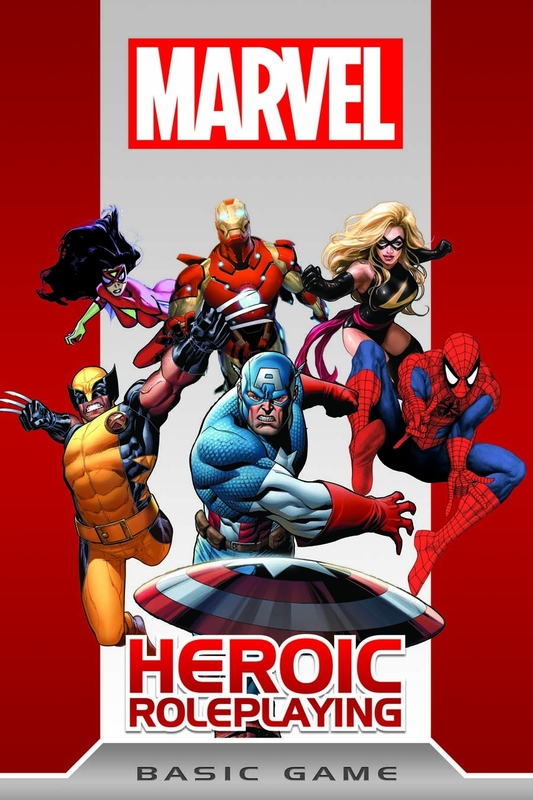 Last night we played around some more with Margaret Weis Productions’ Marvel Heroic Roleplaying. It’s an interesting system that lends itself nicely to storytelling and seems to overcome some of the problems of playing superheroes using the more ‘simulationist’ systems. We’re going to keep experimenting with it and see if we can introduce it to the group at some point. Spider-Man, MJ, and Luke Cage got together for the November 30th tree-lighting ceremony at Rockefeller Center in New York. MJ bought some Cole Haans and then headed toward the Movado store to have a look at the new models. The Mayor arrived and made his way to the podium by the tree, pressing the flesh as he went. To everyone’s surprise, the tree suddenly burst into flame and guns appeared in windows around the plaza. Spidey and MJ disappeared behind a tree to help him get changed while Luke grabbed a nearby Smokers’ Outpost and chucked it at the nearest gunman…the guy’s dentist is going to love Luke! Then a new threat: the Santa several feet from our heroes pushed a boy off of his lap and stood up, seeming to morph into another form while reaching into his bag. He ordered the Mayor and his men to lay down their weapons and surrender. Spidey, now in costume, made a quick move and shot sticky strands to grab the bag and rip it away as it changed and twisted with a life of its own. This drew the new foe’s attention and enraged him. The unnamed villain, undeterred by the loss of his bag, reached into a pocket for an impossibly large hammer to squish the bug that was now bugging him, as the sidewalk beneath Spidey’s feet went a bit soft and he began to sink into the concrete. His spider reflexes enabled to twist under the weapon, however, and he managed to send it back to strike the Christmas freak square in the face…ouch! After a little soliloquy we learn that the fake Santa is called Magnifique, a sorcerer and clearly Mad as a Hatter. He really needed to be stopped before he could cause any more chaos. Luke, himself a master of intimidation, realized Magnifique was using a lot of illusions to add to the confusion and decided to help out his buddy and put this fool out of the action once and for all. He rushed forward to grab the slab of concrete under Magnifique and uproot it, sending the creep tumbling backward. While it put him off balance he landed gently on an airbag that quickly grew from the cracked concrete behind him and he bounded back ready for action. By now the crowd was going crazy, helped by the random gunshots raining down on the plaza and a few additional thugs who had now appeared in the plaza. The gunmen in the windows responded to Magnifique’s orders to “Take them down!” and took some shots at our favorite Wall-Crawler, who was all too happy to shoot out a swingline to dodge the bullets while leading their aim up and away from the crowd. Luke, meanwhile, ripped a string of lights off of a nearby tree and used it like a snare to take down three of the thugs in the crowd who had gotten too close to each other for their own good (he also got a couple of civilians…too bad). After one last ineffectual attack by Magnifique, Spidey shut him down for good by wrapping up his head in a stream of webs and Luke delivered a knockout punch that left him seeing stars. Their boss down for the count, the rest of the gunmen took off to save their own skins. Magnifique is, no doubt, off to serve some time at the Raft! I wonder what tomorrow’s editorial by JJJ in the Daily Bugle will make of the chaos caused by the Web Head Menace and his thuggish friend? I expect he’ll call for renewed support of the SHRA. Next Monday, LL is going to run something for me. I’ll play either Captain America (I’m a Pally at heart) or Iron Man. NB: Magnifique was a villain of my own creation, loosely based on (don’t laugh) Felix the Cat. I’m not really a comic book guy but LL has been pushing me that direction and I’m growing more interested. She sent me home last night with some ‘homework’: TPBs of the first 24 issues of The Avengers and a couple large volumes of The Defenders. I got through issues #1 and #2 last night and, though they’re pretty *bad* I can see where a lot of the stuff I do like from the new Avengers movie has its origins. I think I can stomach iron suits with solar-powered flight if it gets me to modern-day Iron Man. NB2: There was no zombie game on Sunday. I was away camping and LL and the group decided that our last session wrapped it up nicely. We’re going to pick up with Call of Cthulhu character generation next Sunday…though I’m going to dangle Dark Heresy out there just in case somebody wants a sci-fi alternative.